Description: Westbound Desert Wind has just departed Barstow as it speeds toward LA. Description: This locomotive looks pretty new at thetime of the photo. Description: Train 304 with two locos? Description: Amtrak engine lineup at Harrisburg station. Description: Today's EB Pennsylvanian on track two. Next stop Lewistown. Description: The 392 parked on the Rock Track. Description: Amtrak Capitol Limited passing through the Junction as it heads eastbound towards DC. 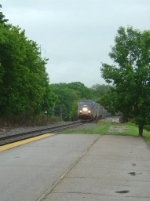 Description: The broken rail caused back-ups and the Capitol Limited had to make an unscheduled stop at Point of Rocks! Description: Amtrak train 80 has just met train 73 in the distance near the mp 301 intermediate signals south of High Point. Description: An Amtrak train heads downgrade and is about to go under the signal bridge. Description: Pulling out of the Longwood siding in the early evening. Description: Both north and south Crescents meet at Tuscaloosa just north of the old interlock tower and the NS/Watco diamond.